This is one of those hikes where you start to doubt if the unrelenting uphill during the first two miles is really worth it. But be assured, its really worth it -- especially on nice clear day. From near the top you can see Mt Rainier, the mountains surrounding the I-90 corridor, North Bend and even the Olympics on a REALLY clear day. To get to this hike take Exit 45 off I-90, pass under the freeway, then turn Left on FR9030 and Left again on FR 9031 which is a gravel/dirt road. Its over 3 miles on an even, but gravel/dirt road -- most cars can make it fine. On busy weekends, keep aware of others coming down the road as its a one lane with many blind spots. This winter started a fairly big washout, you can drive around it for now -- but in 2010 you should check the roads condition at the WTA.org website. Note: A Northwest Forest Pass is required to park here. The trailhead has a big parking lot with a restroom -- no water is available. 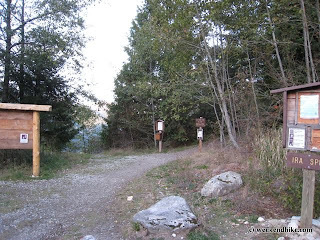 The Ira Spring Trail (Trail 1038) starts right from the top of the parking lot. Be sure to fill-out the Day Pass (no fee) before you start uphill. A friend calls this hike "boot camp" since the first 2 miles is a unforgiving uphill climb with no real switchbacks or flat parts. The trail is fairly wide at first so its easy to pass some slower folks making it up the trek. There is one very steep part where you may need to "encourage" others in your group. This section starts where the old road stops and the more narrow trail starts off to the left. Shortly after this steep(er) section, the trail becomes a bit more tame with switchbacks starting around 3500 feet. 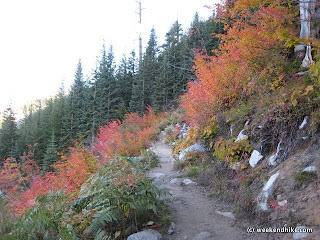 On the day I did this hike (in Early October), the trail was full of very bright Vine Maples providing for some great color. 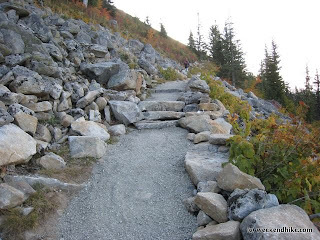 The mid-avalanche chute saw some great improvements this year with some crushed rock and wide steps. Its a really great achievement of some very hard workers. The views also start from here up to the top -- soon you will forget about that previous nasty steep uphill part. At about 4,200 feet, you will reach the turn off to Bandera Mountain. A number of books have different descriptions of the Bandera Mountain trail and the views, but I found this trail currently to be more of a scramble up the hill, plus there was little evidence of anyone using this route lately. For more info on the hike to Bandera Mountain, I would check out the description on page 157 of this book . After scrambling up a bit -- I decided to turn back and continue on to Mason Lake. 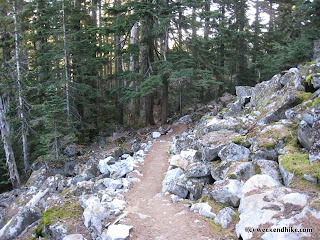 For the hike to Mason Lake, just continue to the Left as the sign notes up the more established trail. I didnt want to fill this post with lots of view pictures, but from this point forward its almost ALL VIEW up the mountain. Photos are a bit tricky in the morning since you are in the shade and the views are in the sun, but there are still great photo ops along the way. Another 0.3 miles up from the sign, you will reach a small rocky area which provides some great views. 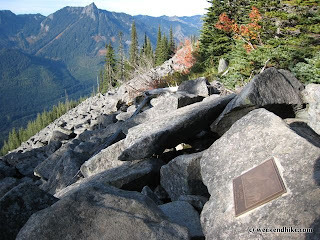 There is a plaque on one of the large boulders dedicated to Ira Spring, for which this trail was dedicated. 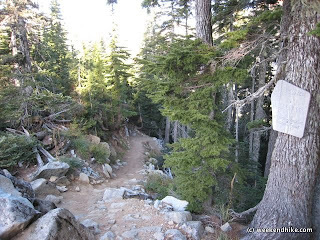 At this point, the trail enters the Alpine Lakes Wilderness area. The trail decends into a evergreen forest toward Mason Lake. Its a nice quick trip to the lake -- just another 0.4 miles. This part of the Ira Spring Trail is well shaded and usually less windy and slightly cooler than the other side of the Mountain. Soon you will cross the Mason Lake outflow over some large rocks. The Lake will come into view shortly as the trail wraps around it. There is a restroom here, if needed. Many folks break out lunch here and enjoy some time at the Lake before turning around and heading back down. 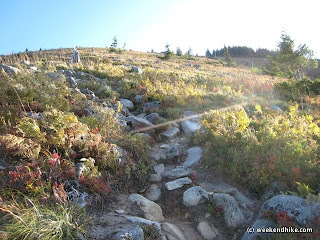 From Mason Lake you can continue on the Ira Spring trail to the junction with the Mount Defianace Trail (Trail 1009). Turn left for another 1.5 miles one-way to Mount Defiance (5584 feet). Or trek to right to reach at the junction to Rainbow and Island Lake. 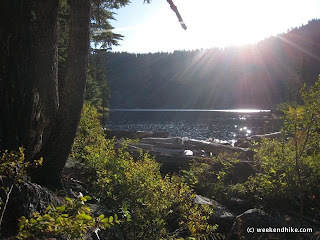 Otherwise most folks reach Mason Lake and then turn around and head back down the mountain to return to the trailhead. 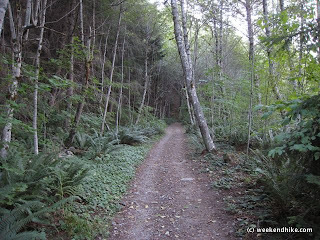 This is another fantastic Snoqualmie Pass Gateway hike. 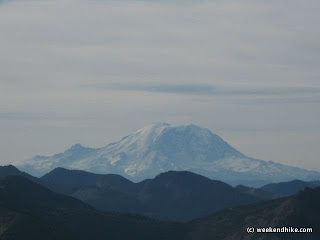 Its one of the best hikes for seeing great views, Mt. Rainer and even a nice small lake. 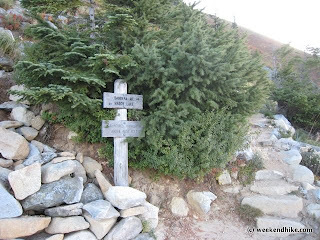 My advice would be to do this hike very early (7am or so), because at 10am there seems to be a big influx of folks starting their trek uphill. Trail - Well established dirt trail, first 2 miles is steep. Dogs - A couple, not the best dog hike. Getting There - From Seattle - Exit 45 on I-90, turn left under the freeway. Keep left on FR9030, Keep left on FR9031. 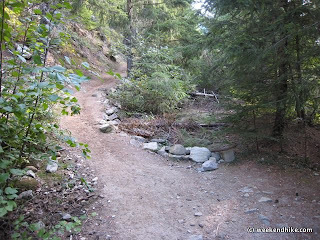 The Forest roads are in good shape, can be rocky and are narrow. Weather - First 2 miles (and at Mason Lake) is in the shade, the upper part of the hike mostly in the open. Facilities - there a restroom at the trailhead parking lot and Mason Lake.